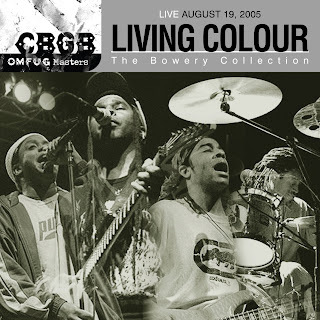 Living Colour recorded live at a benefit for CBGBs at the famed NYC institution on August 19th, 2005. Their original mix of rock, funk, punk and even reggae made Living Colour a household name. They still bring the magic and this live recording proves it. Anchored by Corey Glover on vocals and Vernon Reid on guitar, this CD spans their career and includes the hits "Glamour Boys" and "Cult of Personality," as well as timely songs like "Open Letter to a Landlord," "Terrorism" and "Sacred Ground." This is a pristine live recording, direct from the soundboard.